I understand why people support brands that copybot. Most of the times they’re packaged beautifully (great advertisement, boxed, textures, etc.) I understand that these brands are usually a mashup of the best things we have to offer. But this demoralizes us. This makes us feel that we don’t matter. At this point, we’re creating for the intellectually lazy people to profit off of. I’ve been stolen from recently. I won’t name names, because I feel that it’s a pretty obvious theft, alsi they don’t deserve attention. I don’t want drama. I don’t want to start fight. I, above all don’t want to be disrespected. Last note: Do you own work. Think and create for yourself. Enjoy your life, and what you do, and don’t let things like this get you down. You’re still better than any talentless, thieving, lazy botter sitting behind a computer screen wishing for YOUR talent. Reading the comment, shows obviously that Nova really want that drama when Hervé Faenzo- owner of Murray makes a direct comment by calling out David Cooper – owner L’Etre as the copybotter 🙄 Be rest assured we seem bored already with all these designers. If someone stole your work, do the right thing and stop been so childish spreading and commenting in social media. Blueberry shared some tip on what store owners should do to protect their product.. seem designers are the lazy ones. If you make so much money off the residents who actually buy your products, respect them and protect the products they buy and don’t start some childish drama all over social media. After the shameful show down from last time when she claimed her skin was copybotted only to find they both were using real life inspirations, Rita – owner Egozy now forces second life residents especially the bloggers in her team to choose sides which is a NO NO and totally wrong. Lets be clear here, even David Cooper – owner of L’etre has not been proven in the court of law to be guilty because no one has actually taken him to court. Each person settles with him and then continues to harass him. Good thing he is finally standing up for himself from all of these bullies. In view of the events that are taking place lately, although we are not in favour of creating any kind of controversy/drama, and considering that my main motivation in Second Life is to create; we feel obliged to inform our clients and followers of the continuous persecution to which we have been subjected during the last months. 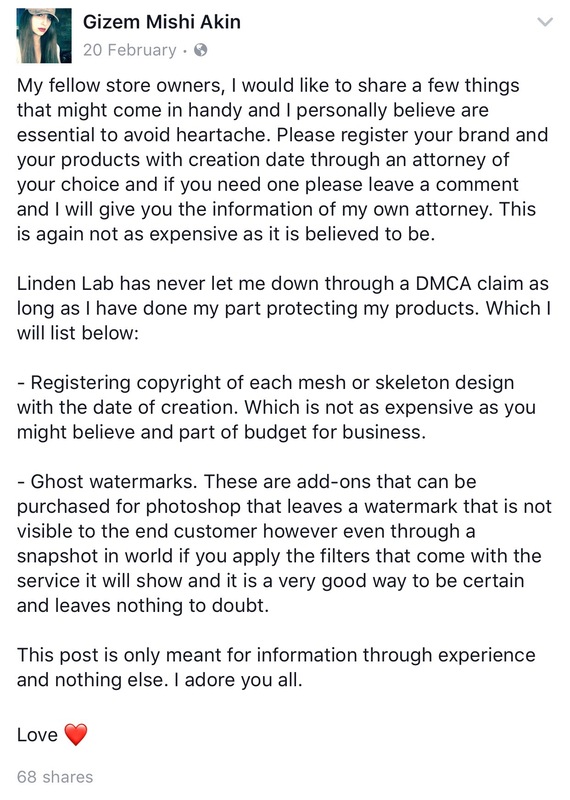 Yesterday it was necessary to remove some of the creations from the store due to a recent DMCA notification filled against us by another creator. Those creations will remain removed from the store until the problem has been resolved. At this point the case is in the hands of our legal cabinet and there has been already sent a DMCA counter-notification to the alleged creator. They already have all the files of our products so they can set up the case and thus be able to compensate the situation through a compensation for the damages caused. The identity of the complainant is currently unknown, but as soon as Linden Lab notifies me of the decisión taken, the necessary procedures will begin to resolve the case in Court. Until then, everything will continue as usual and we will continue creating new items for our precious customers. We will keep you informed. Thank you so much for all your support and understanding. En vista de los acontecimientos que se están dando últimamente, aunque no somos partidarios de crear ningún tipo de polémica y teniendo en cuenta que nuestra principal motivación en Second Life es crear; nos vemos en la obligación de informar tanto a nuestros clientes como a nuestros seguidores de la continua persecución a la estamos sometidos durante los últimos meses. Ayer fue necesario retirar de la tienda algunas de las creaciones debido a la reciente notificación de un DMCA por parte de otro creador. Estas creaciones seguirán retiradas hasta que el problema haya sido resuelto. A estas alturas el caso se encuentra en manos de nuestro gabinete jurídico y ya se ha enviado un contra DMCA al supuesto creador. Ya disponen de todos los archivos de nuestros productos para que puedan poner en marcha el caso y así poder compensar esta situación a través de una indemnización por daños y perjuicios. Actualmente se desconoce la identidad del denunciante, pero tan pronto como Linden Lab me notifique de la decisión tomada, comenzarán las tramitaciones necesarias para resolver el caso en los tribunales. Hasta entonces todo seguirá con normalidad como hasta ahora y seguiremos creando como de costumbre. Una vez el caso sea resuelto realizaremos las comunicaciones necesarias. Muchísimas gracias por todo vuestro apoyo y comprensión.